Harvard lacrosse player Brad Cappellini wasn't a lone runner after later being joined by some of his fellow lacrosse players and members of the Boxing Club. “It’s good for the legs, which gives us power, and it’s rewarding,” said George Hageman, president of the Harvard Boxing Club, who led a dozen club members up and down the stadium on a recent afternoon. One morning last month, a solitary figure started up Harvard Stadium’s rows of cold concrete. He avoided the easier, smaller steps, instead using long strides and an exaggerated arm swing to move up the wider seats. He turned to the stairs only for a relaxed walk back down, moved to the next section, and headed up again. Since 1903, the fields at Harvard’s iconic stadium have seen contests of all kinds: football, lacrosse, rugby, soccer, even ice hockey. But there’s a dedicated contingent that routinely runs and walks the ziggurat-style rows at Harvard Stadium whose efforts show that there are athletes in the stands as well. Some are members of sports teams, seeking the unique combination of cardiovascular and muscular intensity that bounding up the stadium seats can provide. Some are fighting the effects of a modern, inactive lifestyle or the inevitable slowdown of age. And most, at one time or another, with legs like lead and lungs burning, have had to dig deep and find that something that keeps them going. 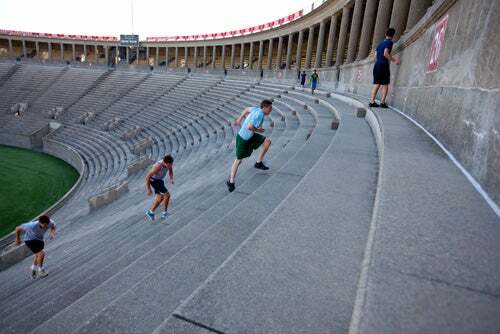 Though the most common way to tackle the Steps of Death is to run or walk up the seats and then walk or jog down the smaller steps, athletes use Harvard Stadium in a variety of ways. A few hours watching on a busy afternoon can yield almost as many variations as there are people working out. Some new to exercise or returning after a long layoff can build endurance by running up and down the steps themselves, avoiding the more challenging seats entirely. Others running the seats can do a few sections instead of the whole circuit, go up and down sideways, or mix in activities like push-ups and stretches. There’s even video evidence of Harvard wrestlers crab-walking and carrying each other up, piggyback. The practice took on the trappings of ritual in 1960, with Harvard’s legendary crew coach, Harry Parker. Parker, fresh from the 1960 Olympic Team, coached freshman crew that year. For training, he took a page from the books of West Coast Olympians who used stadium running as part of their training. In the years since, Parker has taken his teams to the stadium whatever the weather, shoveling snow for winter workouts. The height of the seats, Parker said, provides not just a strenuous workout, but is the perfect conditioning for the leg portion of the rowing motion. The stadium workout, Parker said, has been one piece in the training puzzle that has led to Harvard’s dominant crew teams. Today, crews from area colleges and high schools seeking to emulate that success work out at Harvard Stadium, and so do members of other Harvard teams. One recent afternoon saw members of the men’s lacrosse team and the Boxing Club working out on the steps, along with a smattering of other students and people from the nearby community. William Graham, Albertson Professor in the Faculty of Arts and Sciences and dean of Harvard Divinity School, counts himself among the stadium runners. Graham, 68, who is leaving the deanship in July, said he turned to doing the 37 stadium seat sections when a foot injury ended his long-distance running career over 30 years ago. These days, Graham comes to the stadium every other day and says that using stair-climbing to keep in shape for mountain climbing has additional benefits — he can work out at just about any hotel around the world when he travels. He has climbed hotel back stairs in Istanbul, Cairo, Bangkok, and Delhi — and has taken a side trip to traverse Athens’ Olympic Stadium. Running stadium steps is done around the country, of course. But aficionados of Harvard Stadium insist the concrete edifice isn’t just the nation’s oldest. For this activity, they say, it’s the best. Other stadiums rise at a gentler angle, robbing stadium runners of intensity, some say. Or they have noisy seats made of aluminum, not concrete. Or they have backs on the seats, making traversing them impossible. “You can flow around the stadium; there’s no obstructions,” said Larry O’Toole, founder of the Somerville-based Gentle Giant moving company, who has run Harvard Stadium since he was a rower at Northeastern University in the 1970s. Today, O’Toole is something of an expert on running stadiums. His athletic past and chosen field makes him prize conditioning both for himself and his workers. O’Toole has made running the stadium a rite of passage for new employees, a test that, from O’Toole’s point of view, reveals a person’s mettle, both physical and mental. “You can tell everything about a person if you bring them over there,” O’Toole said. As the company has grown around the country, it has subjected new hires to whatever stadium or imposing hill is nearby, such as San Francisco’s Telegraph Hill. But O’Toole says it’s not the same as the original, so he still leads employees to the stadium when they come visit the home office. Paul Berkeley, a lifelong resident of the Allston neighborhood, has been running the stadium for 20 years and is among a group of community members who take advantage of their proximity to it. Berkeley rises three times a week for the short jog to the stadium and his typical 5:45 a.m. start. Berkeley, 62, a runner all his life, began to have knee and hip problems when he was in his 40s. He shifted from running on the road to doing tours of the stadium. At first, Berkeley did just six or seven sections, gradually adding more until he was completing a circuit of the stadium’s 37 sections. The stadium has seen more than its share of highly trained athletes over the years whose competitive natures have pushed them to complete the 37-section circuit faster than others, or to do it more than once. Parker said the speed record for completing a circuit is in the 16- to 17-minute range, though O’Toole said he knew someone who did it in 13 minutes, in 1984. “This guy was absolutely phenomenal. We’d start on opposite sides, and he’d try to go around twice while I did it once. I was 33; he was 21,” O’Toole said. In the early 1980s, Parker and Charlie Altekruse, a three-year varsity oarsman and member of the U.S. crew team for the boycotted 1980 Olympics, decided to do a “century” — 100 sections, or just under three full tours of the stadium. Both finished in less than an hour.